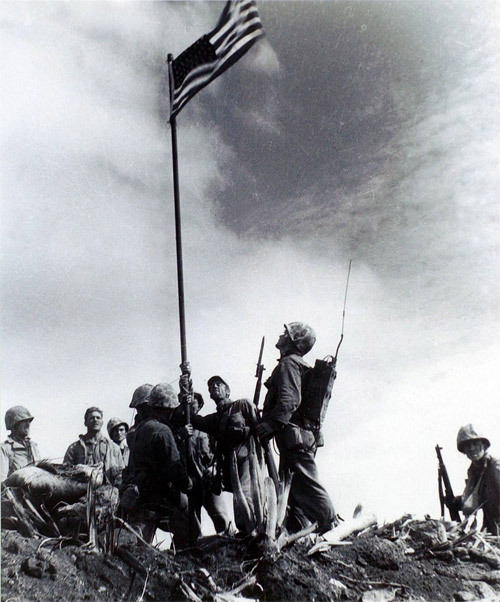 United States Marines from the 5th Division of the 28th Regiment gather around a U.S. flag they raised atop Mt. Suribachi on Iwo Jima during World War II, Feb. 23, 1945. This was the first flag raised by the Marine Corps at Iwo Jima. The raising of a second, larger flag later that day was made famous in the prize-winning photo by Associated Press photographer Joe Rosenthal. Raymond Jacobs, now 79, of South Lake Tahoe, Calif., claims that he was the radioman standing at right center in this photograph.